Sometimes the little things grab our notice. In this case, here's a standard Tableau bar graph, and we'd like to have it show the bar's values as labels. Tableau makes this simple and straightforward. See below for the main methods for doing so. It's somewhat picky to focus on the difference in capitalization, but some friction points are smaller than others, and they all add up. It's also worth noting that the other options in the Marks card's Label button are all proper cased, matching the Analysis menu options. Except for the option under 'Options'. Dang. Thanks, Robert. Too quick on the scan, somehow went right over that. Now I'm thinking about how I missed it and what the appropriate capitalization scheme should be when the label is more like a sentence. This is one area where I find Tableau fairly consistent. Generally I find that control labels, in this case a check box, use sentence case, while a menu items use proper case. Another example is in the right-click menu of table calculation pill we see 'Compute Using', and in the Edit Table Calculation dialog we see 'Compute using' for the label of the drop-down box. I took a quick look, and found check/radio controls are proper case, instead of sentence case, in the Add Action dialog. I do not know Tableau's convention, maybe there is reason for this different case use. According to Tableau: "The Windows Design Guidelines provide different rules for the context in which the string appears. In this case, labels on widgets in dialogs (or drop downs that in this case are essentially dialogs) uses sentence caps (just the first char). Labels for menu items and toolbar buttons (and their tooltips) use initial caps on every word." 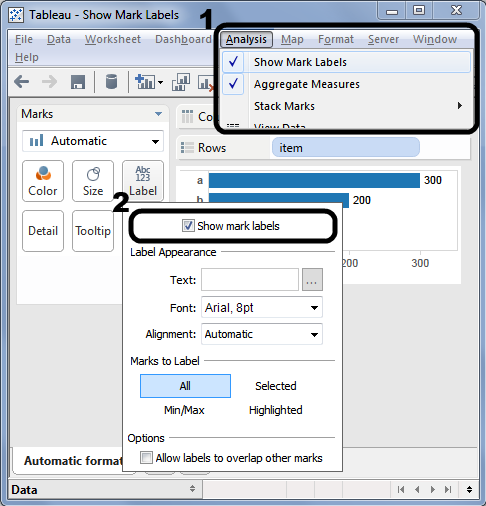 So Tableau is being consistent with the WDG, which has its benefits. It feels to me that this is a technical consistency that was applicable to Windows-defined interactivity based upon the explicit use of specific UI controls for rigidly defined purposes, along the lines of "this control type exposes this type of functionality that fits within the Windows-mandated functional segmentation designs, so when you present one of these use these stylings to help people understand that the thing they're seeing is one of these functional elements"
Which made sense within the limited horizons of the Windows application design space. Although that space was never really highly thought of in terms of usability. 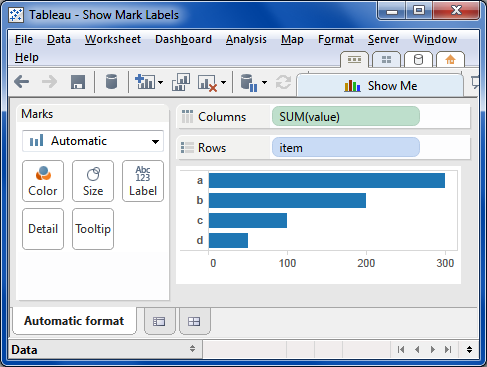 The larger question I'm thinking about is: what makes sense from a Tableau user's perspective? Is the UI consistent and as transparent as possible for them? Which isn't the same as being consistent with a set of guidelines created to enforce compliance in a related but separate domain. But this is a small matter, and it really worth sweating the small stuff?